You will love this one and it is not too difficult to make! This is a gorgeous stately Georgian Gingerbread House and true to its heritage it does include Georgian Colonial features: Square, symmetrical shape. Paneled front door at center, Decorative crown over front door, Flattened columns on each side of door, Five windows across front, Paired chimneys and a Pitched roof. 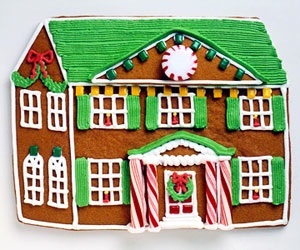 Visit here for details BHG to make this lovely Colonial Gingerbread House.